Maryfield Farm is situated on the south Deeside road approximately 1.5 miles from Banchory, mid-way between Crathes bridge and the Bridge of Feugh. We have reared turkeys at Maryfield since 1981. The family decided to concentrate on bronze turkeys and changed to a free-range rearing system from the mid-eighties. 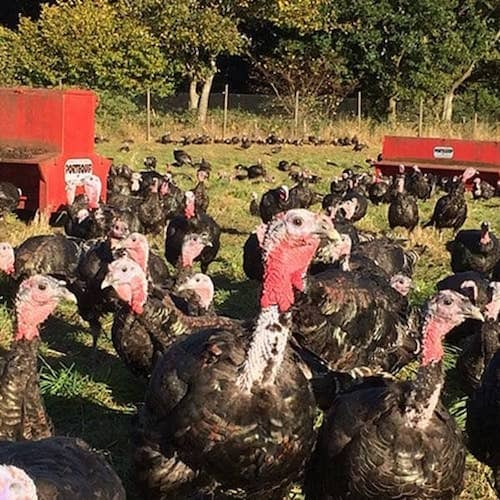 Maryfield was one of the first Scottish farms to rear turkey poults from Kelly’s hatcheries in Essex and that relationship continues today. The turkeys arrive as day-old chicks in June and once off the heat, move out to the fields where they supplement their diet, of grower pellets, with grass, docks and nettles. From pellets, the birds move on to homegrown oats. They grow more slowly but the flavour of the end product is well worth it. The birds are processed traditionally – dry plucking and hanging for ten to fourteen days in a cool controlled atmosphere giving succulent meat with loads of flavour. They are then hand eviscerated in a modern state of the art processing room and stored with their giblets in the huge cold room until collection. Bronze turkeys are the Rolls Royce of turkeys with a high meat to bone ratio. There is no doubt that birds which are free-range, dry plucked and hung have a full old-fashioned flavour and texture. Maryfield is one of only a few producers left who still dry pluck and hang their birds. Christmas and New Year are traditional with many families enjoying a special feast. We would like to help make the food you serve to be delicious therefore making every festive meal you have from Maryfield a memorable one. With 28 years experience Maryfield can be proud of its Bronze turkeys.